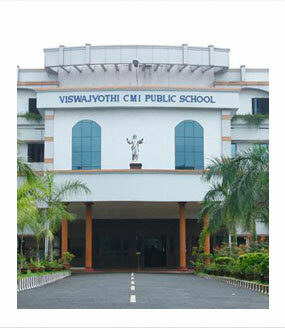 Viswajyothi CMI Public School is situated by the side of the Main Central Road (MC Road), three kilometers away from Angamaly towards Kalady. The school campus spreads over a vast area of 12.13 acres. The school has a Kids Block where the Kindergarten and Primary Classes function. It has a large international standard Swimming Pool and Fitness Centre with all modern facilities. Classes V to XII function in the Main Block. Here the Administrative Block, Chapel, Priests’ Quarters and the Boarding Houses are situated. Both sections are connected by a foot over bridge and have a state-of-the-art infrastructure, spacious grounds and Indoor and Outdoor Courts for sports and games.